Most of our clients already know what they want and how they want their website to look like. This is good for us and the client because it makes work easier and we can finish the work faster. But there are just times when the client just wants a website but cannot decide on how he/she wants the website to look and its features. This is where our Elegant Themes Website Package comes in. 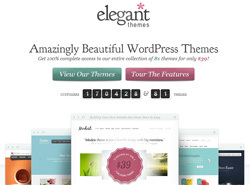 This package uses wordpress as a platform and uses the themes from Elegant Themes. Clients who don’t have any idea how they want their website to look, can browse the templates gallery Templates Gallery. Once the client has choosen a template, our service comes in. Integrating the content collected from the client and making adjustments to the template so the content will integrate to the chosen template properly. The package also comes with our usual web hosting and domain name services. For more details about the package please drop us a message at the contact form found at the bottom of this page. We have moved to a new location at #13 Paradise Village, Banilad, Cebu City, Philippines 6000. Migration to Cloud Server success! We just migrated to a cloud server. We had a minor problem with the php version that came with the installed CentOS but everything is fine now. Here are some early warning signs of a problem project and some tips for upgrading them from hopeless to profitable. Acmeweb solutions has been offering Content Management Systems for awhile now, and a post explaining what it is and whether it would be an effective solution for our clients is long overdue. We hope this article would be helpful to our existing and prospective clients who are looking to self-publish content on their websites. A Content Management System (CMS) allows the user to create, manage, and delete content from their websites without the need for going through us to do these updates. This means you can add new pages, articles, or products on your website with easy to use tools that does not require technical knowledge of HTML (although a little know-how would be useful). Adding content is very similar to editing a Word document, with tools for font-formatting, adding new images and the like. The system also allows you to add, and manage the links for your navigation menus. Of course there are limitations with CMS’s, for example you can only typically edit the content, but you cannot do any updates to the layout or general design of your site. Your site will be defined by a general layout, with a “content region” where your content will go. The position of the navigation menu will also be defined and cannot usually be moved to another position unless the layout allows for this flexibility. However these are all normal conventions for websites, and they aren’t really flaws, they are just something to keep in mind with websites in general. Click here to view our location in google map.